Technology has been evolving quickly these days, a little too quickly for some people. Our everyday lives have been drastically altered, though many people rarely stop to think about it. Remember dial-up connections? Remember when it took five minutes to load one picture? Remember hearing ‘You’ve got mail!’ every time you signed online? The times, they are a’changin’. 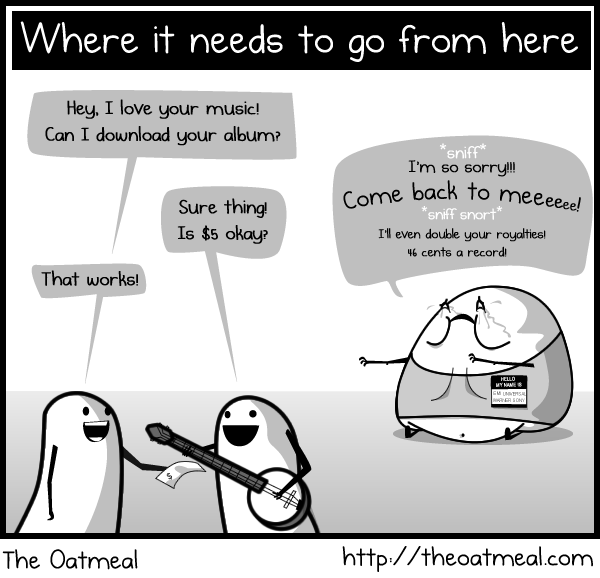 This is especially true in the music world. The problem is no one can really tell you if it’s changing for the better or worse. The documentary Press. Pause. Play. takes an in-depth look at the issue. It’s absolutely worth the watch, if you have the hour or so to devote to it. If not, the first ten minutes will be enough to give you an overview of the subject. Have you ever heard the term MIDI before? It’s fine, most musicians throw the word around and don’t even know that it’s an acronym for Musical Instrument Digital Interface. MIDI is basically music data. It’s a set of instructions that tells an electronic device what to do. For example, old cell phones used MIDI data to create your monophonic and polyphonic ringtones. So why does MIDI matter? Well not only has MIDI become the common format to control synthesizers, keyboards, and more, but it also gave birth the concept of a home studio. MIDI made the one-man-band possible. MIDI has helped make some of the most extraordinary music when used properly. For example, Pink Floyd’s epic piece Shine on You Crazy Diamond would have been empty without the legion of MIDI controlled synths within the recording. Thirty years later, MIDI is alive and kicking. ToonTrack’s MIDI drum programs are unparalleled. Most people can’t even tell the difference between their MIDI drums and live drums. Chromatik is another example of how technology is changing the face of music. Chromatik is an app that can be used on a phone, computer or tablet device. It uses technology to better music education. For example, music teachers can transfer sheet music to their students securely. Me2UMusic is revolutionizing the way we purchase music. Their new app allows users to quickly purchase and gift individual songs, albums and even custom made playlists. I daresay the romantic mix tape lives again! On the flipside, many big wigs in the music industry swear that technology is ruining everything. Some say that file sharing has lead to decreased record sales. The RIAA recently announced that piracy causes over $12.5 billion of economic losses yearly. It also puts over 71,000 people out of work each year. Many music and tech bloggers feel these numbers are exaggerated, however. A new study conducted by the American Assembly proved that some of the biggest media pirates also legally purchase thirty percent more music than other people. Ironically, the people committing the act are probably paying for more music than you do. However, piracy has also lead to a raise in demand for otherwise unknown artists in different parts of the world. This could lead to tours in different areas that never would have been possible before the Internet. So the piracy issue truly is a double-edged sword. Many indie musicians would argue that piracy leads to the increase of merch sale – after all you can’t download a t-shirt…yet. Even this ABC blog argues that piracy isn’t killing the music industry. Some bloggers even argue that it’s helping the industry stay alive. Personally, I feel like the industry is indeed changing, however it is not changing fast enough to keep up with the times. We are jumping into a society in which people want content, and they want it constantly. Most people would also prefer to not pay for said content. Once the industry realizes music should be free, things will begin to stabilize. Fans will buy albums, vinyls, shirts and stickers regardless. Coming from a more creative side of things, technology has really messed up music to some degree. With the invention of auto-tuning software, creativity and talent are no longer as important…or necessary. It’s also is beginning to make many musicians sound the same. Hometracked.com, a music blog geared towards the home producer, put out this post on the top ten auto-tune abuses in the pop world. Pro Tools and other recording DAWs (Digital Audio Workstations) have features such as quantization that remove even more human qualities from music. Performing quantization on music basically takes any sort of imperfection in a recorded performance and fixes it to a grid based on beats. So in English, if a drummer messes up, this will fix everything perfectly…and robotically. So has technology improved or hindered music? Discuss in the comments below! Just one guy from the Bronx's opinion on video games.